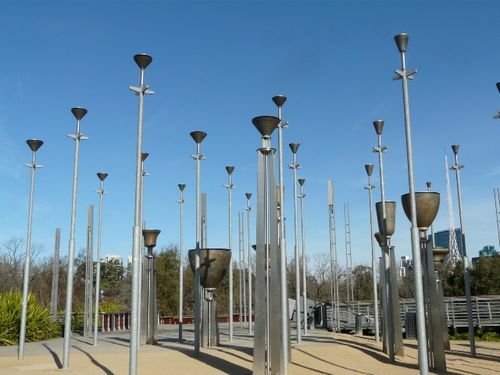 The Federation Bells, are bronze-alloy bells on galvanised-steel poles, commissioned by the Victorian government in 1998 as part of commemorative celebrations for the centenary of Australian Federation in 2001. The Federation Bells comprises 39 upturned bells of differing sizes, mounted on poles ranging from two to six metres high. The size of each bell determines its pitch, and collectively the pitch ranges over four octaves. Most of the bells are harmonic and very pure in their tone; seven are polytonal, so able to play more than one pitch with a single hammer strike.